A huge number of the features we have added to ManageWP since its inception have been suggested by you – the user. You’re not reading that wrong folks – we are going to give one of you a thousand bucks, and all we want in return is a simple idea. To be more specific, an idea for a new feature that we can implement in ManageWP. It’s this simple – we care a great deal about making a better product with each new update we release, so we’ll happily hand someone $1,000 for a great idea. And we know that you guys are certainly not short of them. Not only is this your opportunity to make ManageWP a better tool for all of us, you can also get paid a hefty sum for your efforts. 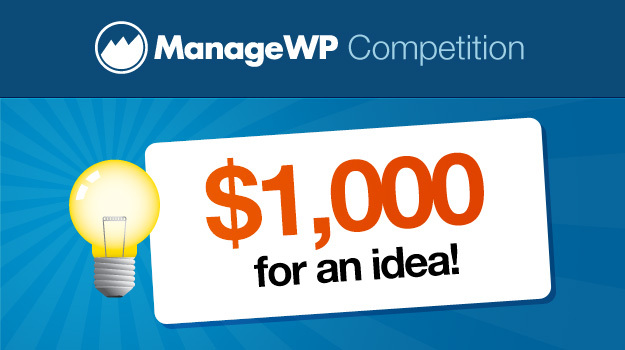 The competition really is that simple – $1,000 for the best idea, no strings attached. In order to submit a feature suggestion as part of this competition, the first thing you need to do is create a ManageWP account, if you do not already have one (don’t worry it’s completely free to do so). Once you are a registered user, you will be able to submit your suggestions via the ManageWP dashboard. Please note that a maximum of three feature suggestions are allowed per person, so please think long and hard before making your submissions. You are welcome to join in the fun in the comments section below, but please note that feature suggestions made via the comments section will not be counted. Again, only suggestions made via the ManageWP dashboard will be considered. The competition will be open until midnight on Saturday 11th August. Until then, you can take as long as you like in thinking up the best possible feature suggestions and submitting them to us. The winner will be picked personally by ManageWP’s founder Vladimir Prelovac, and will be announced here on the ManageWP blog on the 13th of August. Oh, I am so disappointed I missed this. Not seeing a link to do this? I use Moodle for the LMS based sites I run. I use WordPress for the CMS sites I run. Any chance you could bring these together to manage moodle and wp from the dashboard? This idea is associated and I know you will resist. Have a team of pro users who are happy to earn some extra bucks where new users can pre-pay for 30 minutes coaching and give the pro admin access and the pro goes through a pre-set checklist and education with Skype screensharing. I know that, although you probably have loads of educational stuff online, I think that at least 50% hate looking at lessons and that 50% of the 50% would be delighted to pay really good money for an expert to show them the features. I would! Who can you recommend? You don’t need a new feature as much as a process to ensure that new users know how to take full advantage of the existing features. I would suggest that you physically sit behind some new users who install ManageWP but with your hands tied behind your back and tape over your mouth and so you are NOT allowed to help them install or figure out how best to use the existing features. This will teach you some painful but profitable lessons. Then I would create a Youtube channel entitled “ManageWP TV” which shows real users taking advantage of key features and then each week or each month have an alert saying that there is a new video to watch. My idea to implement comments management is already there, i asked this to the support and the next week it was alive ! It is unlikely this will happen but in this case we would split the price. Please submit a ticket to support and they will enable it for you. We got your responses. You can always click the same link again to edit them until competition closes. Just hit the “Submit” button and just blinks at me. Not sure if my idea has been accepted or not. Please check and get back to me. Also I had to enter the html entity for single quote in order for it to show up properly. Please let me know whether it was submitted or not. I hope I win 🙂 – I’ve submitted 3. Thanks guys. I have many many many more ideas if these do not suffice. I’ve just submitted the idea but I wasn’t able to get confirmation after clicking the Submit button. Not sure if it’s just me; else it might confuse others.